Buying a bike today is not easy! A lot of factors like price, make etc. make the process even more tedious. Earlier bikes use to be a means of conveyance, but today a bike is a lot more than that. The Indian automobile market has grown conspicuously in the last few years and the biggest factor driving this change is the change that’s happening in the consumer’s mindset. A few years down the lane, factors like mileage, longevity etc. dominated the consumers thought process. Today it’s the look, the brand and more importantly the engineering that takes the center stage. But this doesn’t come cheap. Today a decent bike from a reputed brand costs close to a lakh. But wait, with a couple of smart moves this won’t be a problem anymore. Today used bikes are a smart option and not a primitive step anymore. 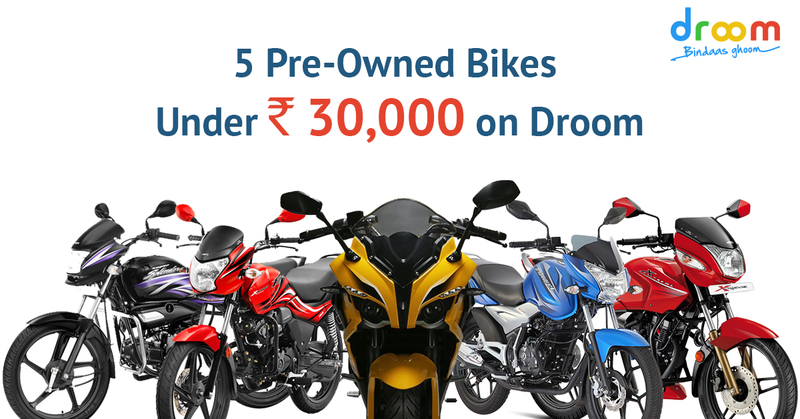 We bring to you these 5 amazing pre-owned bikes listed on Droom which cost below ₹30,000. And the best part, they are verified by Droom! The masculine beast by Bajaj is no newbie. It has always been a popular choice among the youth, thanks to the amazing technology it boasts. Also both the trim, 135cc and 150cc are available on Droom at amazing prices. Equipped with a high-tech Dtsi engine and digital meter it’s definitely a catch! One of the best city bikes by Bajaj. Both the trim, 125cc and 100cc are available on Droom at jaw dropping prices. And the best part, bikes as new as 2013 make are available under ₹30,000. They are definitely a smart choice, owing to the amazing looks and the pocket friendly mileage. One of the best buy from Hero. This classic has a history to back it as well, when it use to be one of the best options for budget oriented commuters. And as far as reliability is concerned, well they all are verified by Droom. Well the name says it all. If you looking for a bike that gives you the mileage, the performance, and most importantly the reliability factor you value, this would be the best buy. And what’s better, we have both the pro as well as the plus variant listed on Droom. So if you looking for a heavy duty partner who doesn’t burn a hole in your pocket, this would be the perfect pick. This fancy bull by Hero was always a catch! Before the jazzy KTMs and pulsar were in the market, the mid segment was dominated by the CBZ. Looks, engine, power, you name it and Hero has it in the CBZ. So what’s stopping you? Log on to droom.in today or download our app and ride your way with that dream bike! After all the weekend getaways are going to be so much fun with all that savings! Droom is Proud to be Associated with IBW 2016! thank you for all your efforts that you have put in this. Very ineirtsteng info. â€œAim at heaven and you will get earth thrown in. Aim at earth and you get neither.â€ by Clive Staples Lewis.